The Helmeted Friarbird is typical of the generally unattractive friarbirds, but is rendered even uglier by the lack of feathers on the back of the neck, giving the bird the faint appearance of small vulture. The protuberance on top of the bill is usually flatter and more even than in the silver crowned and noisy friarbirds. This is the most likely friarbird in the tropical rainforest, and is common in the lowland jungle, as well as in neighbouring woodlands, mangroves, parks and gardens. 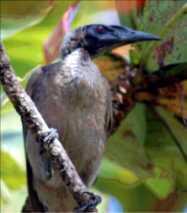 It has a range of loud calls, including "wak-a-wear, wak-a-wear, wak-a-wear", and is often heard in lowland tropical rainforest, such as on Marrdja boardwalk, in the afternoon.